Struggling to sleep while pregnant? Have you ever considered a full body pillow or something similar? If so, we’ve got the best maternity pillow for every mum-to-be. When people find out you’re pregnant, the comments about a good night’s sleep being a thing of the past come thick and fast. But what they don’t tell you is that sleep can prove to be just as elusive during pregnancy. As if the constant toilet trips and raging hormones aren’t enough, as your bump gets bigger, finding a comfortable sleeping position gets harder and harder. If you’re an expectant mother and have never tried using a pregnancy pillow, you’ll be thankful to know they can support your bump and ease pressure on your back, making you more comfortable in bed. So, to help you relieve any discomfort, we’ve sifted through hundreds of maternity pillow reviews to find the top-rated for sale on the market in 2019. Our detailed buying guide and review of hand-picked products will cover everything you need to know to choosing the best pregnancy pillow for you and baby. U shaped maternity pillows cocoon your body, providing soft support on all sides. The QUEEN ROSE is one of the larger long pillows available – great for you, but if you sleep on a standard double mattress, your partner may find themselves pushed out of bed. A King size mattress may be fine. It is also incredibly versatile. When lying down, the shape mirrors the contours of your pregnant body, and the legs of the pillow fit neatly between your knees, helping to level your hips. If you’re sitting up in bed, you can prop it behind you and bend the legs around to support your arm and baby when nursing. If you’re used to sleeping with a low pillow, you may struggle with the height of some maternity pillows. One of the nice features of the QUEEN ROSE is that you can remove some of the stuffing inside to adjust it to the right height for you. The polyethylene fill is easy to remove, but it takes a bit of effort to redistribute the stuffing across the pillow, so you won’t want to do it too often. If you’re still struggling to sleep with the U-bend under your head, you can always turn the pillow around, so this section is at your feet, and use a traditional regular pillow to support your head and neck. The QUEEN ROSE comes in two lengths (140cm and 150cm), but taller women may find that the legs are a little short for comfort, particularly if you prefer to sleep with your legs straight or slightly bent. You can remove the cotton cover for washing, but due to the ergonomic shape, it can be tricky to get the cover off and on, particularly when you’re heavily pregnant. You may find it easier to slip a normal pillowcase over the head end. This pregnancy pillow has a simple design with a curved head end (unlike the squarer shape of the above reviewed) and two long legs. The legs aren’t ergonomically designed, so it’s likely to suit a wide range of heights as the padding is equal along the length of each leg. This also means it can accommodate a wider variety of sleeping positions. If you’re used to sleeping on your back and are struggling to get used to sleeping on your side, you may prefer the design of the Bedding Direct UK to the QUEEN ROSE. You can wedge yourself against one of the legs and lie back, giving you the feeling of sleeping flat out, but your body will still be angled to the left – better for baby. The spiral hollowfibre fill traps air, ensuring the U shaped pillow keeps its structure and loft. If you find the fill compresses a bit over time, then plumping (or fluffing) should help fluff it up into shape again. It’s also hypoallergenic and machine washable – perfect if you have sensitive skin or suffer from allergies. One of the few negatives about the Bedding Direct UK option is the cover. When you open your parcel, you’ll find the pillowcase is separate to the pillow itself, so your first task after unpackaging is to wrangle the cover onto the pillow – easier said than done! The cover is a tight fit, particularly around the curved head end, which some people find uncomfortable. It may also lead to the stitching being stretched and coming apart over time. If you’re not a fan of cream, you’ll be glad to know that the full body pillow is also available in navy blue, sky blue, white and wine colours. There’s also the option of a snuggly fleece cover – perfect for curling up with in winter. Plus, we love the fact that it’s made in Britain. The CosyDreams U shaped pillow curves around your body to create an oval nest, supporting your back and taking pressure off your hips. At 160cm long, it’s longer than many others on the market, so is a good option if you’re taller than average. On the flip side, it may be too big and bulky for petite women. It’s quite firm, and if you’re used to resting your head on something softer, you may find the CosyDreams a bit too hard. You could add a softer layer on top of it, but this would add extra height to what is already quite a bulky pillow. It does also soften over time. The cover is a bit tight around the head end of the pillow, and some people have found it can bunch up and dig into their shoulder. To avoid this, you can either sleep a little lower down (so your head rests on the side of the pillow) or turn it around and use a standard pillow for your head. It always strikes me as odd that many manufacturers don’t offer spare pillowcases for pregnancy pillows. When you sleep on a pillow night after night, you want to be sure it’s clean, and it’s not always possible to get a wash load dried in a day. Fortunately, CosyDreams bucks this trend and you can buy spare covers for your new pregnancy pillow in a range of colours. The covers are also easier to get on and off than others in our review section. Thank you, CosyDreams! Overall, this is a great value long pregnancy pillow. You may find it wears faster than more expensive models, but if you’re only using it for the duration of your pregnancy, you shouldn’t find this an issue. 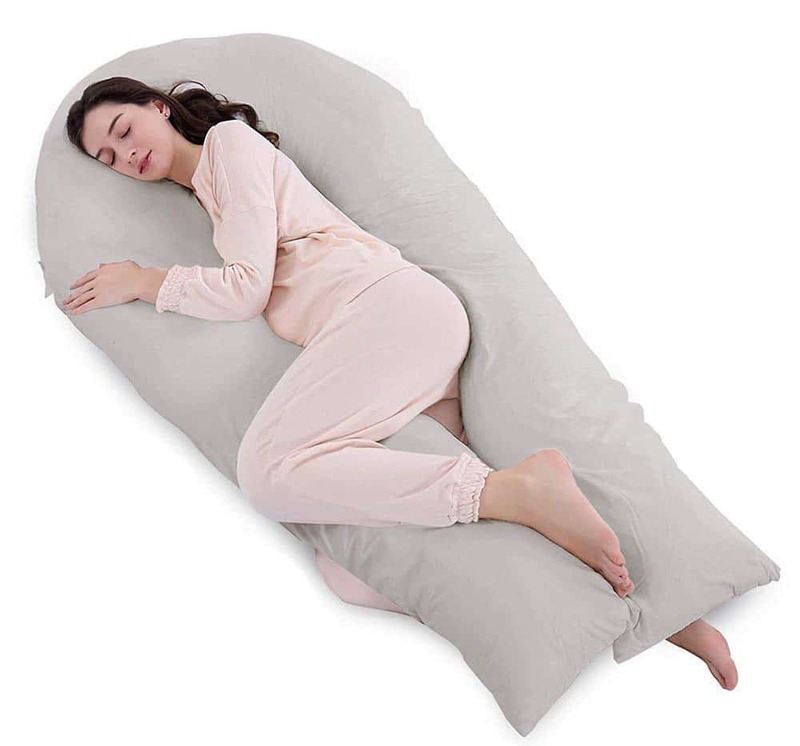 If you’re tall, then finding a long pregnancy pillow that offers support along the full length of your body can be tough. 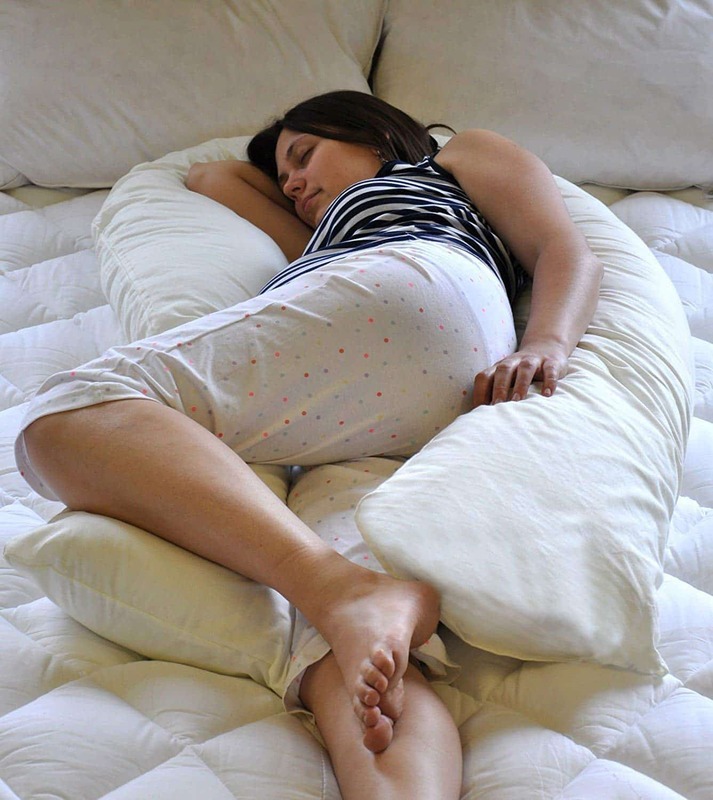 Sleepdove’s version comes in both a regular and long size, giving options for everyone. The legs on the large size are each 180cm long which means that even if you’re tall, you can use them as padding between both your knees and ankles. This helps keep your legs and hips in a neutral position while you sleep, reducing hip and back pain. It also provides good bump and back support. The bend at the top of the pillow is quite tight, and if you have broad shoulders, you may struggle to choose a comfortable position for your neck. The stitching of the pillowcase at this point can also dig in. If you’re handy with a needle and thread, you can remove the cover and make some alterations, but admittedly, this is a bit of a hassle. It’s nice that a maternity pillow at this price point comes with a removable cover, and although it’s a little fiddly to get it back on, it’s not impossible. This is one of the cheapest pregnancy pillows on the market, and this is reflected in the build quality and materials used. As well as issues with the stitching, a few people have reported problems with splits in the fabric and broken zips, particularly when trying to get the pillow into the cover. If you’re looking for a long-term pillow (e.g. 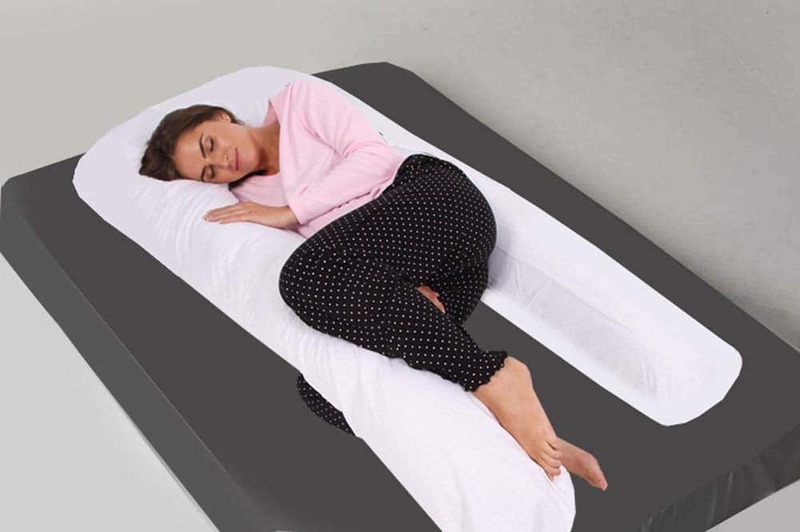 if you suffer from non-pregnancy related aches and pains) then it may be worth investing in a higher quality buy, but if you’re only going to be using it for a few months, the sleepdove is a great value option. 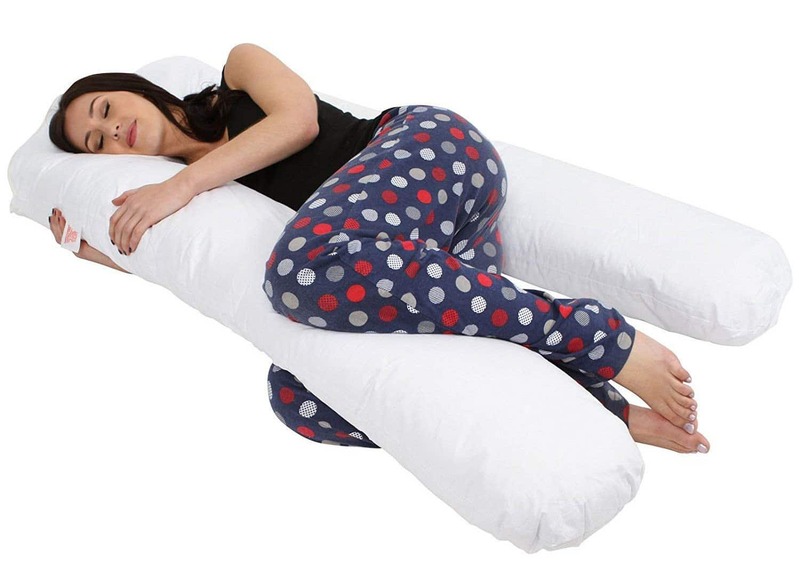 The Chuckle pillow has an ergonomic design similar to the Sleepdove. It’s symmetrical, so if you turn over during the night, you don’t have to worry about rearranging your pillows. If you’re the right size and shape to fit the curved design, then you’ll find the Chuckle super comfy and supportive. The square shape of the head end and cut out for the shoulders means it may be more comfortable on your neck than pillows that have a tighter bend. However, it is shorter than some others here, and if you’re tall, then you may find the contoured design doesn’t suit your particular body shape. The PP cotton filling is supportive yet soft – this is certainly a pillow you’ll love to cuddle in bed whether pregnant or not. It doesn’t have quite as much stuffing as others, and as a result, it’s a little less firm. This will either be a pro or a con for your depending on your personal preferences! The machine washable outer cover is 100% per cent cotton, not the poly-cotton mix that cheaper pillowcases use. It washes well and feels soft against your skin. If you sleep in a smaller bed, you (and your partner!) will appreciate the fact that the design of the Chuckle takes up less space than most U shaped pregnancy pillows. Although most Chuckle pillow users have found it’s helped them get a better night’s sleep, a few people have reported issues with lumpy or reduced stuffing. This seems to be a quality control issue, but Chuckle does offer a full warranty so if you do have any issues with the manufacture of your pillow, you should be able to receive a refund or process an exchange. Love2sleep’s Big U maternity pillow is a basic, low-cost model that will help you transition to sleeping on your side when pregnant. It’s designed for you to sleep with your legs bent, with the pillow between your knees. If you prefer to sleep with your legs a little straighter, or you have a long body, you may find this one a bit on the short side. Out of the bag, the Big U is fluffy and plump. Unfortunately, it does flatten pretty quickly, and the hollowfibre filling tends to clump together. Over time, this can create uneven patches of stuffing with flat, thin sections – not ideal. Regularly plumping your pillow may help it retain its loft and you can always add an extra pillow to raise your head, but the Love2sleep is probably best treated as a short-term solution to help you sleep during the later stages of pregnancy. On the plus side, you can always use it for extra support when relaxing on the sofa, reading or breastfeeding even if you don’t want to use it in bed. The pillow comes with a removable poly-cotton cover that’s machine washable.Love2sleep also sell replacement pillowcases for the Big U in a variety of colours, so you match your new pillow to your bed linen. Like many pregnancy pillows, it’s a bit of a pain to take the covers off and on, and it’s worth treating gently, so you don’t risk splitting the seams. Perhaps now is an excellent time to encourage your partner to help with the laundry?! Love2sleep also seem to have a few quality control issues. While most people haven’t had any problem with their pillows, some have had issues with seams and zips ripping as well as the filling clumping together. That said, their customer service is prompt and efficient at responding to any problems. The Dreamgenii is a different style of pregnancy pillow to the U-shaped models above. It has a one-sided design to help you get used to sleeping on your left side by supporting your bump and back and lifting your upper leg to align your hips properly. It takes up much less space in the bed than U-shaped maternity pillows, which your partner will be pleased about, but due to the one-sided design, it may be frustrating if you tend to switch sides during the night as you’ll need to move the pillow around. There’s no way this pillow can fall out of bed as you lie on the centre panel between the bag cushion and bump cushion. The curved leg support should then fit neatly between your legs. It suits most sizes and shapes, but larger ladies may find the design is a little too constricting and the back support insufficient. The Dreamgenii also doubles as a feeding pillow. Once your baby arrives and as it’s not too bulky, it’s easier to transport if you’re away from home than a larger pillow. Unlike most pregnancy pillows which come in boring white or cream, the Dreamgenii has a range of pretty covers to choose from, made from a soft cotton jersey. You can also buy extra covers, though they are pricey, and some people have reported issues with covers splitting when trying to get the case on and off the pillow. It’s not the cheapest of maternity pillows, but if you don’t want to share your bed with a large, bulky or long pregnancy pillow, the Dreamgenii is a great alternative. Whether you’re already a mum, or perhaps this is your first, it’s crucial to know that making yourself comfortable at night benefits not only you but baby too. Before it comes to buying time, mums can spend hours scouring pregnancy pillow reviews, but the truth is, what works for one person may not work for you. Every person has their requirements, sleeping habits and preferred positions, which makes all the difference when it comes to choosing the one which ticks all the boxes. Maternity pillows can help cure back and pelvic pain by supporting your body in an optimum sleeping position. They come in all sorts of shapes and sizes, from small angled cushions to support your baby bump, to giant “crocodiles” that cradle your whole body. Here’s our complete guide on finding the best maternity pillow to help you sleep sound. Whatever your natural sleeping position, it’s recommended that you sleep on your side during the later stages of pregnancy (from about 28 weeks). Several research studies have shown that the risk of stillbirth increases if women sleep on their backs during the third trimester. Sleeping on your side also helps the flow of blood and nutrients to the placenta. As the position you go to sleep in is the one held longest throughout the night, there’s no need to worry if you wake up on your back. Simply roll back onto your side and go to sleep again. If you’re used to sleeping on your back or front, then learning to sleep on your side can be a challenge. That’s where a pregnancy pillows come in. They are designed to support your body in a side-sleeping position and ease some of the more common ailments that can stop you getting to sleep. As your bump gets bigger, you may feel aches and pains as the ligaments in your stomach and back stretch to support your bump. Supporting your bump when you’re sleeping on your side can help relieve the strain on these ligaments and reduce much pregnancy-related discomfort. You can use a normal pillow, but you might find a good quality pregnancy pillow provides firmer cushioning and support. Pelvic girdle pain affects around 1 in 5 pregnant women and can make sleeping and getting up in the night painful and uncomfortable. Sleeping on your side with a pillow between your legs can help keep your hips aligned and reduce discomfort. If you suffer from pelvic pain, it’s also worth considering how easy it is to climb in and out of bed with your pregnancy pillow, particularly as you’ll be making regular toilet trips during the night. A U-shaped design, where you can push one leg of the pillow off the bed to get in and out may work better than a C-shaped pillow that you have to climb into. As well as stopping you from rolling onto your back while you’re asleep, a pregnancy pillow can help keep your back, neck and head in alignment, relieving pressure on your spine. Hormonal changes, not to mention having a growing baby pressed against your stomach, can lead you to suffer from heartburn. Propping your head and shoulders up in bed can help prevent stomach acid coming up while you sleep. During the early stages of pregnancy, you may be able to use a couple of regular pillows to help you sleep more comfortably. But as your bump gets bigger in the second and third trimester, your decision to purchase a maternity pillow can make a huge difference to whether you sleep well or not. The wedge is designed to slide under your bump and support its weight, relieving pressure on your abdominal ligaments and back. You can also use one as back support, or underneath your breasts, particularly when they’re feeling tender post-partum. They’re small, lightweight and multi-functional – great for travelling or if you don’t have much spare space in your bed. Bring one of these home and your partner could be forgiven for thinking you’ve invited someone else into your bed. U-shaped pillows are large and bulky, but they provide support for all parts of your body. If you use the pillow the “right” way round, there’s a pillow for your head at the top and two “legs” that you lie between. One supports your back and prevents you rolling onto your back when you’re asleep, and the other supports your bump and provides padding between your knees. Some women prefer to flip the pillow over, so the curved part of the “U” is under their feet. You may find this more comfortable if you have a regular pillow that you’re used to sleeping on. U-shaped pillows give you a wonderfully comforting cocooned feel and are ideal if you have to learn to sleep on your side. The downside is they’re big and bulky. This isn’t likely to be a problem if you have a king-sized bed, but if you’re sleeping with your partner in a standard double, it may feel a little crowded. C-shaped pillows are designed to follow the natural curve of your spine, providing support for your head, back, hips legs and bump. The base of the “C” fits between your legs, and you rest your head on the top part with your back nestling into the curve of the pillow. 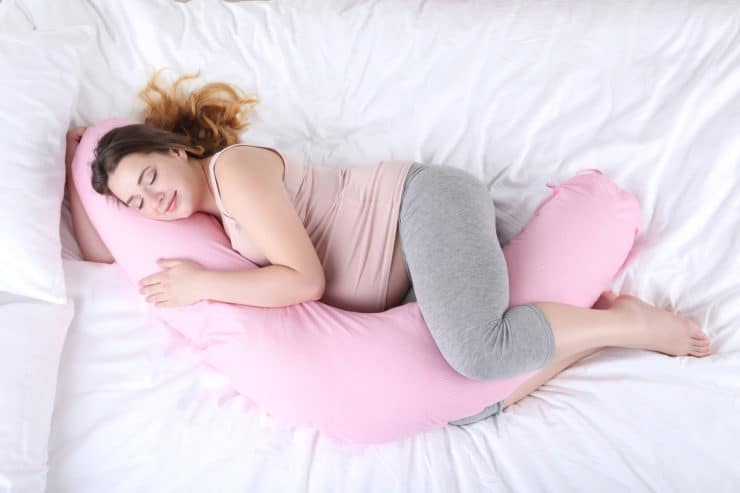 Plus-sized women may consider this style of pregnancy pillow most comfortable as you can adjust the shape to suit your body more than with a U-shaped design. C-shaped pillows are a bit smaller than U-shaped but have the disadvantage of being single-sided – if you switch between sleeping on your left and right, you’ll have to turn the pillow around which isn’t always easy. Depending on the room temperature, especially during hot summer nights, you may end up too warm using a U-shaped or C-shaped pillow. Full-length, or I-shaped is a long, straight or slightly curved pillow, similar to one leg of a U-shaped pillow. They take up less space in your bed, and you can use it either behind you, to support your back, or cuddle it in front of you, to support your bump and legs. Hollowfibre fill is typically used in larger pillows. It’s hypoallergenic and machine washable, but quite heavy, especially when you have a six-foot pillow to lug around. Memory foam is often used for wedge shaped pillows where you want firm support. If you prefer natural materials, you can also buy down filled pillows. Pregnancy pillows obviously don’t fit in a standard pillowcase and, although most have washable covers, it’s often a bit tricky to wrangle it back into the cover. If your pillow doesn’t come with a case or you can’t be bothered taking the cover on and off to wash, you can either pull a regular case over the bend in the pillow or cut one open to wrap around the head end. You don’t have to stop using your pillow when you give birth. Your body still needs support to heal and relieve the aches and pains from giving birth. Some pregnancy pillows can also double up as a nursing pillow. Or you may end up becoming too attached to your new pillow to give it up. Although they may be marketed as maternity pillows, U and C-shaped pillows are also excellent if you suffer from chronic pain in your back, shoulders or hips, arthritis or fibromyalgia. This is partly because the pillow provides support for your body, but as it creates a “nest” for you to sleep in, you’re less likely to move around in your sleep and wake up. If you’re ready to introduce a new bed partner into your relationship, we’d recommend the QUEEN ROSE U-Shaped Pillow. Its contoured shape and adjustable fill moulds to your body providing the right level of support. Even once your baby arrives, you can continue to use it to support your baby when feeding. It can feel hard to justify buying a pillow for merely a few months’ use, but most mums-to-be would agree that a good night’s sleep is priceless. Just don’t leave your partner and your new pillow alone in the bed for too long – pregnancy pillows are so comfortable, you may find that you’re the one who ends up being relegated to the spare room.